AccountEdge offers full-featured accounting software for your small business, on the desktop. No monthly subscription. You own your software and your critical financial data. Each year, we offer upgrades at a discounted price, but it’s always your choice. Pricing below includes initial purchase price, 5 years of payroll for 5 employees, and 4 years of product and feature upgrades. Obviously, your needs may be different, which would also change the pricing. If you need any assistance or have pricing questions, please work with Customer Care (800.322.6962) on your specific requirements to best understand AccountEdge's offerings and pricing. Pricing comparison as of August 2017. AccountEdge Pro is a $399 one-time fee for the initial license. $249/year for Payroll Tax Plan, this plan includes all payroll tax table changes, and product upgrades. $99/year for Payroll Forms Service for Federal and State reporting. QuickBooks Online Plus $35/month for first 6 months, then $50/month after promo. 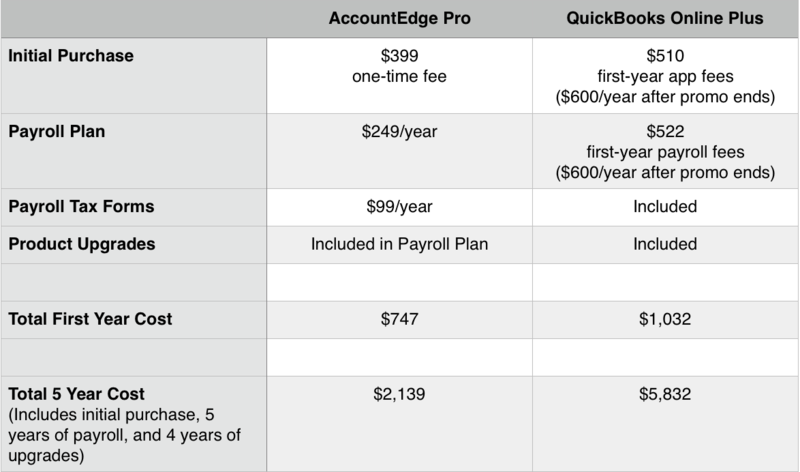 QuickBooks Enhanced Payroll is $12/month for first 6 months, then $25/month after promo. Additional $5.00/employee per month for payroll processing. This plan includes the latest features, payroll tax filing, and direct deposit.